Putin praises Trump, trashes Turkey in three-hour press conference. Russian President Vladimir Putin speaks during his annual end-of-year news conference in Moscow on Dec. 17, 2015. Every year around this time, Russian President Vladimir Putin gives a wide-ranging, marathon press conference. While many of the questions are softballs from the official media or concern obscure regional issues, some independent journalists do attend and there are usually at least a few tough questions asked. But it’s not really about the questions. It’s about Putin. And this year, after a very eventful few months for Russia, the president didn’t disappoint, holding forth in characteristically defiant and occasionally obscene style for more than three hours. The president, who met with U.S. Secretary of State John Kerry this week to discuss proposals for ending the war in Syria, seemed a little more conciliatory toward the U.S. than he was previously, saying that Russia’s plan of resolving the Syrian conflict “in principle, matches the U.S. vision,” despite a number of differences. 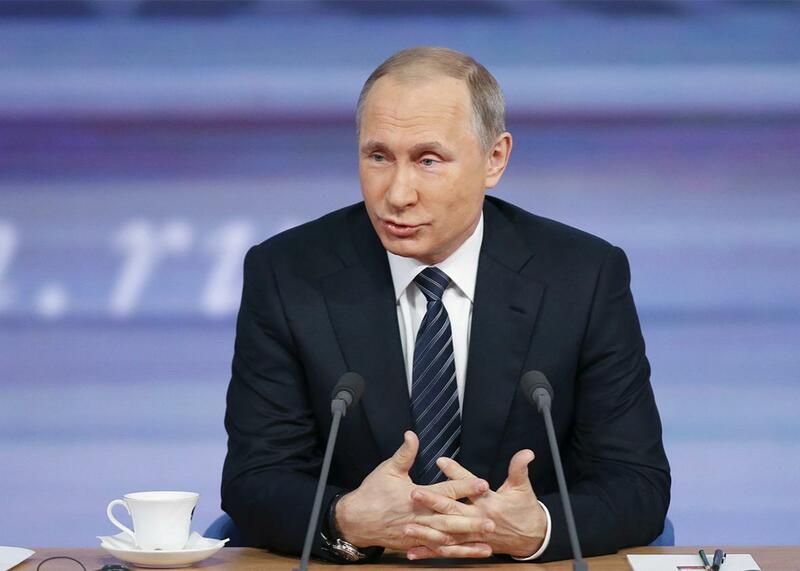 Putin admitted for the first time that the Russian military has a presence in Eastern Ukraine. “We never said there were not people there who carried out certain tasks including in the military sphere,” he said, somewhat cryptically. He also announced that the Russian economy had hit bottom and would bounce back next year, contradicting the view of most economists, including his own Central Bank. One of the most surprising questions was about his mysterious daughters. Mariya and Katerina are barely acknowledged by the Kremlin and rarely appear in public, but Katerina, a former competitive dancer turned tech investor, has been the subject of a great deal of speculation, including a recent Reuters investigation into her influence. In response to a question about their whereabouts, Putin would say only that both his daughters live in Russia, each speak three languages, and that he was proud of them. “Every person has a right for their fate, they live their own life and do it with dignity,” he said. In one testy moment, Putin was asked about allegations of corruption against Russia’s chief prosecutor Yury Chaika, whose sons are accused of links to organized crime as well as the severe beating of investigative journalist Oleg Kashin. He referred the question to a government oversight office before changing topics. Putin denied allegations of doping against Russian Olympic athletes and said, as he has previously, that embattled FIFA chief Sepp Blatter deserves the Nobel Peace Prize. Despite all the challenges Russia has faced over the past year and an economy still in the doldrums, Putin remains extremely popular, unquestionably in command, and—judging from Thursday—feeling pretty confident.